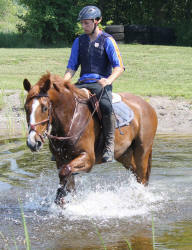 Allie arrived at Prospect Equine Farms in July 2011. A chance visit to Sue Ockendon's Farm and a side trip to the farm of Olympic Eventer Peter Barry's farm to view a young mare that Sue thought we would like brought her to our attention. It was love at first site for Mitchell and even though the young 3 yr old Mare bucked enough for Mitchell to jump off twice, she was loaded into the trailer and brought home. Have only been ridden a few times as a young 3 yr old, Allie learned very quickly and by the beginning of 2012 as a young 4 yr old she and Mitchell had already become a team. 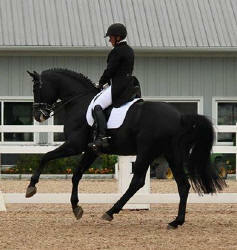 In May 2012 Mitchell and Allie attended their first show - a Bronze Dressage show at Bluestar. While she was a little spooky, she handled her first outing in a busy environment very well. By the end of the day she relaxed and settled into her job. Training with the help of Ian Roberts, Judy Hodgkinson and John Hobson for jumping while their regular Coach Michele Mueller participated in the Olympics and continuing with their dressage coach Karin Davis through the spring and summer of 2012 along with a few entry events proved to lay a great foundation for this pair. With their first event at Grandview and their second at Dreamcrest, where they got their first placing at 5th. Allie and Mitchell also participated in the Canadian Young Event Horse Competition placing first in the 4 yr old division with some impressive comments from the judge on her ability. 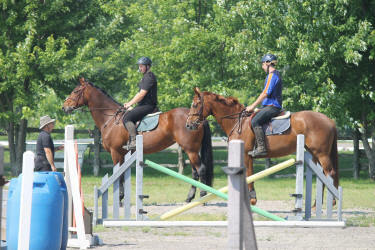 The balance of 2012 was a training and learning year for Allie and Mitchell with Michele Mueller. 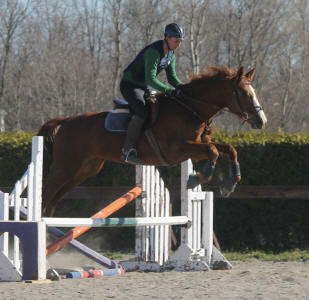 Training over the winter with Karin Davis for Dressage and Michele Mueller for jumping have the team ready for 2013. A bounce provided a bit of excitement and a greenie moment. Plans for Allie and Mitchell in 2013 are to begin the season at a few combines at the pre-training level. The Winter saw a lot of dressage work and some jumping. A new custom Stubben Saddle for Mitchell and Allie had its first trial with a hack in the cross country field. 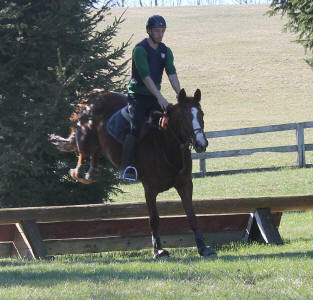 and a great Cross Country schooling. Prospect's Free Spirit and Mitchell completed their first Pre-training event. It was a real learning experience for them but they completed the event with lots of lessons learned. Prospect's Free Spirit completed her 2nd pre-training event yesterday - August 3, 2013 at Grandview - placing 7th out of 18 - she received a 9 for gaits on her dressage test. Her rider received a 7 for rider position. A tiny bobble on stadium added 4 faults and a beautifully run cross county by this five year old ended a fantastic day for her and Mitch Hall﻿. July 26, 2014 - Grandview was the first event for Allie and Mitchell this year. Allie was a little unfocused in dressage but one rail in Stadium and 2 runouts in cross country at least saw a completed event. 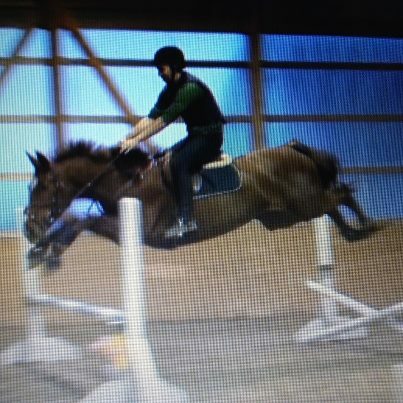 A work in progress for this 6 yr old mare. Interesting day for Allie and Mitch at Lanes End. Best dressage so far and a good stadium - a bit fast. XC was a bit fast - I think we may have to work on that. She was a bit strong. Mitchell and Prospect's Free Spirit at Dreamcrest. Allie was a distracted young 6 yr old throughout dressage - something maturity and exposure are sure to work out in the future. Some beautiful moments and definite improvement from the last test. Stadium as handled well with only one rail and they handled the challenging cross country course very well with only a round out at the ditch - even still making perfect time. Seems ditches are something that they need to work on but form is a beautiful thing to watch when it comes to this mare. The pair finished 17th out of 26 in a tough field. September 11, 2014 No effort and a beautiful jump is what this 6 year old is bred for and it shows - through the Jump Chute - Video below. October 21, 2014 -Today Allie did a jump bounce. May 2015 - Allie is being bred to the Hannoverian Stallion Donnegan for an April 2016 foal. While Allie is taking on the role of motherhood her training will be suspended. May 13, 2016 - She has arrived. Join us in welcoming Prospect's Amelia - born at 12:30 am on May 13, 2016 in the middle of a thunderstorm. Out of Prospect's Free Spirit (Freedom Z) by Donnegan (Don Frederico). We think she is black or very very dark bay with two white hind socks and a white blaze. January 17, 2017 - Interesting pic by a friend working on some photo options - excited to see this mare back to work after having a foal. This was at Lanes End in 2014. February 21, 2017 - So good to see Allie back to work - looking forward to watching her compete this year. October 21, 2014 -Today we did a Bounce Jump Grid with the girls. At the end of the session the boys switched horses for the first time ever.